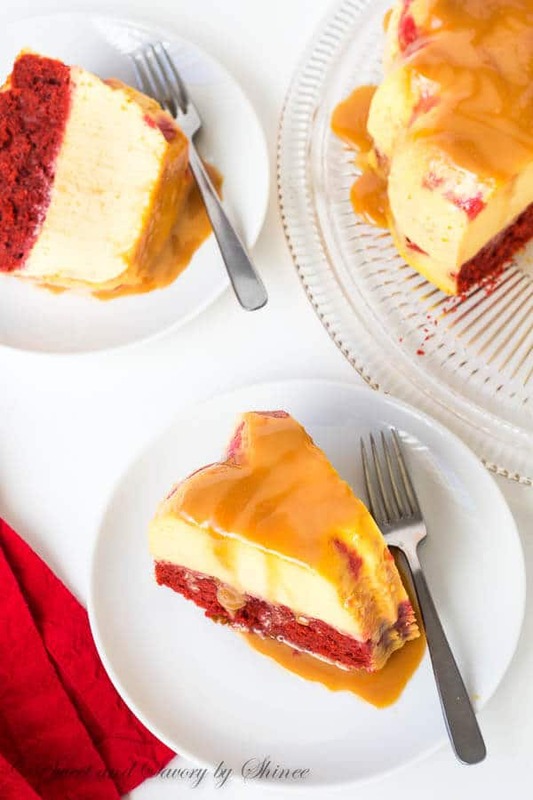 Impress your sweetheart with this fabulous magic red velvet flan cake. This cake is not only stunning to look at, it’s also absolutely divine to devour! Plus, something magical happens during baking. Woo-hoo! I’ve been waiting to share this beautiful cake with you for quite some time. Since November, I think?? You know, when I was going crazy in my kitchen baking away to prepare bunch of new recipes in advance before my little guy’s arrival. In the process I almost gave my in-laws diabetes! I mean we’re talking so much sweets and chocolates and cakes. Each recipe is made at least twice, so you do the math! But I didn’t get a single complaint when I sent this gorgeous cake out to the ranch. Only the praises! They’ve been talking about it weeks later. How could you not though! 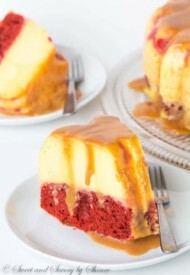 We have a layer of moist red velvet cake, then smooth and rich flan, topped with sweet and delicious caramel sauce. Tell me how could you not love this giant gorgeous layers of deliciousness?? And what’s the magic about it, you ask? 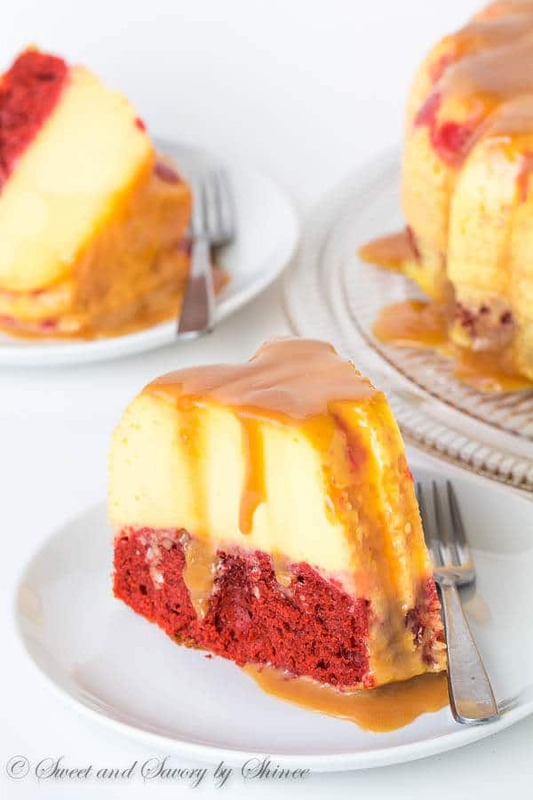 You see, when you make this cake, you first pour the caramel sauce, then you add your red velvet cake batter, and only then you top with your custard. And while it’s baking in the oven, magic happens: the cake layer and flan layer switch places. What? Yes, yes, it truly does!! You just have to try it yourself to believe it! Now, this is, of course, not something I came up with. I wish I was awesome like that, but I’m not! I saw this magic chocolate flan cake on Cook’s Illustrated magazine. I was so intrigued by the magic part, that I had to try the recipe right away. And I’m so glad I did! Then I decided to swap chocolate cake with red velvet cake to inspire you for Valentine’s Day dessert. You’ll totally impress your valentine with it! Don’t be intimidated with the magic part, or ingredient list, or lengthy directions. As long as you follow the directions, you’ll get the gorgeous cake just like I did. To be honest though, when I first made this cake, I was super anxious whether it turned out or not. Right out of the oven, it didn’t look like the layers had switched. I still saw a layer of custard (see the center pic on the bottom row ? ), but have faith. It works every time, like magic! And guess what? You need to make this cake in advance, preferably the night before you’re planning to serve. This cake needs some time to set. Perfect for special occasions, don’t ya think? So are you going to treat your sweetheart with this magic cake? I’m definitely making this again for Valentine’s Day! Can’t wait. ? Preheat the oven to 350°F (175°C). Coat 14-cup nonstick Bundt pan with a cooking spray. Warm the caramel until it’s pourable and pour into the pan. 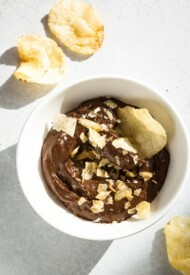 To make the cake, whisk together flour, sugar, cocoa and salt in a medium bowl. Set aside. In a large mixing bowl, beat the egg, vegetable oil, buttermilk, red food coloring and vanilla extract until well combined. Add flour mixture and mix until smooth, about 1 minute. In a small dish, mix together baking soda and vinegar. While the soda/vinegar mixture is bubbling, add it to the batter and mix well. 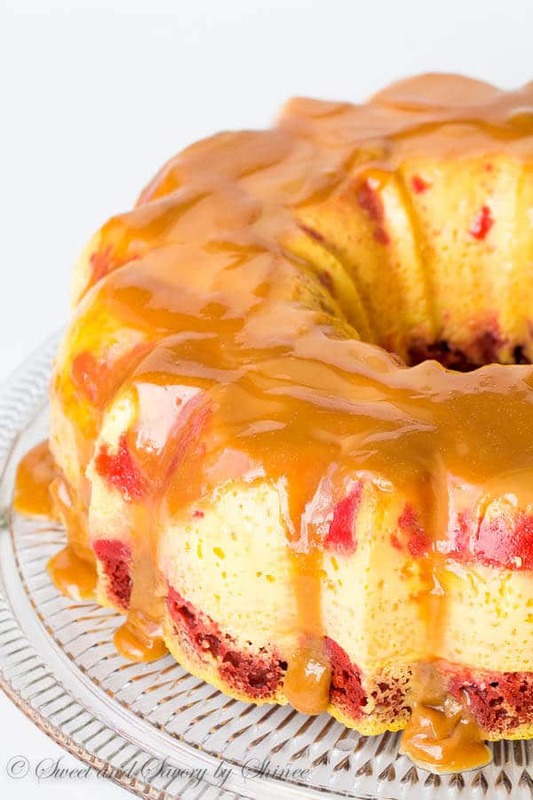 Pour the cake batter over the caramel in the Bundt pan. To make the flan, place all the ingredients for flan in a blender and blend until nice and smooth. Carefully and slowly pour flan over the cake batter and place in a deep baking pan. Pour warm water into the baking pan until it reaches half way of the Bundt pan. Bake the cake for 75-90 minutes, or until inserted toothpick into the cake comes out clean and the flan reaches 180°F. Transfer the Bundt pan onto wire rack, cool to room temperature about 2 hours, then refrigerate until set, at least 8 hours. Place the bottom third of Bundt pan in a bowl of hot tap water for a minute or so to soften the caramel sauce. 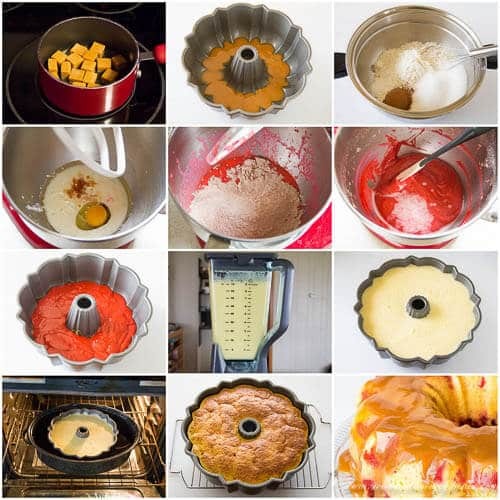 Place a cake platter on top of Bundt pan and gently turn platter and pan upside down. Slowly remove pan, allowing caramel do drizzle over top of cake. 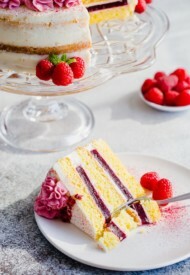 Serve the cake immediately, or refrigerate until ready to serve. Wow, this looks amazing. Love how it inverts. I need to make one of these. You sure do, Beverly! It’s fun to make, to brag and to eat! 🙂 Thanks for visiting! Looks so good. Thanks for sharing it at the Inspiration Spotlight party. Pinned & shared. See you again soon. This looks sooo good! I’ve made the chocolate magic flan cake ……but recently I’ve become a big red velvet fan – so this is a must make! Oh my, was that the most fabulous cake or what? Hope you give this red velvet one a go too! Thanks, Elle! 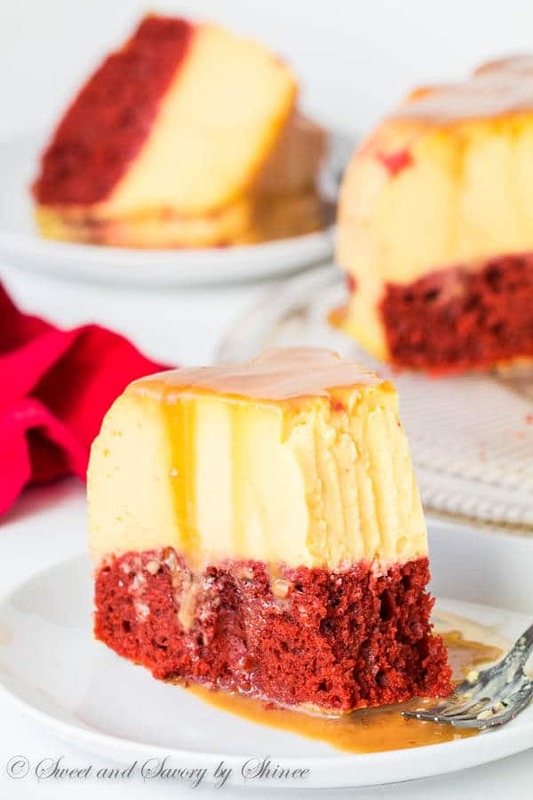 What a gorgeous Valentine’s Day dessert! It looks absolutely scrumptious! Doesn’t it? 😉 Thank you, Michelle!